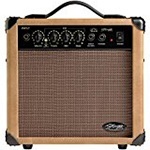 →What is the Best Acoustic Guitar Amp? Finding the perfect amplifier is a crucial part in creating that huge, full-bodied sound that we as musicians strive for. A good amp can bring a flat guitar to life, lending its sound exceptional clarity and depth, allowing you to see your sonic dreams fulfilled. A bad amp, however, can turn even the most beautiful sounding guitar in to a dull and lifeless piece of wood. As a guitarist, having the right know-how to choose the best acoustic guitar amp for your gigging needs is very important. Luckily, choosing a great amp is not very difficult. Before we get into more detail about about what to look for to find the best acoustic guitar amp for your needs, lets have a quick look at what we feel are the overall top 5 acoustic guitar amps available on the market today. For more information on all 5 of these amps, just skip to the end of the article. A high price is not always synonymous with quality. When choosing an amplifier for your acoustic guitar, there are more than a few things that you should be looking for in order to assure that you make the best possible choice. Built in effects are included in many acoustic guitar amplifiers, especially in higher end tube amps, and solid state amplifiers in general. If you are going to be using effects, it might be a financially sound decision to purchase an amp with build in effects such as reverb, echo and chorus. A combo amp is a perfect choice for a travelling musician who doesn’t have enough space in their vehicle to transport bulky equipment, or even to store it. While a half stack might look more impressive to the audience, a combo amp is usually far more practical, especially for the average gigging musician. Combo amps tend to have more features built in, and due to their compact size, they are also much easier to store. Half stack amps are the amps most commonly seen on stage at venues. These amps consist of a head and a cab. Half stacks may weigh more and they may be more bulky, but they have a certain charm and ability that combos do not. Whereas with a combo, what you have is what you will have until you buy something new from the ground up, with a half stack, you can buy a cab and a head, and replace either piece of equipment at will, making these amps more versatile and valuable for gear lovers. Solid state amps are amplifiers that are built without tubes. These types of amps generally make use of a circuit board and are much lighter than their tubed counterparts. For purists and truists, solid state might not have been an option previously due to the somewhat sterile sound these amps tended to have in the early and even middle 2000s. Now, however, recent models such as those offered by Line 6 have a much purer sound and stay loyal to that classic tube amp tone without the added weight and cost of the average tube amplifier. Tube amps have been considered the “true” musician’s choice up until recent years. Tube amps use a set of tubes to create their tone. The tubes can be changed out for other models in order to change the warmth and overall impression of the amp’s tone. Tube amps tend to be heavier and a bit more expensive, however they also tend to be of a higher quality and have much more longevity than solid state amps. If your amp is going to be an investment, tube amps might very well give you more mileage for your dollar. Why Buy an Acoustic Amp? Check out this awesome video by Kaos Music Centre on why you should buy an acoustic guitar amp. Buying the right amp is a slow and lengthy process. With all the options available at guitar stores, the process of choosing the right amp for your needs can be very confusing. Any of the following amps is a good investment and will provide you with quality and, just as importantly, a long and beneficial relationship with your first piece of acoustic guitar equipment. 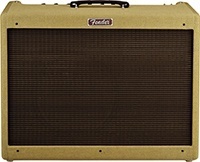 Fender has long been renowned as one of the premier blues and acoustic guitar amp manufacturers in the world. The Acoustasonic has a beautiful, crisp and clear tone that allows each singular note to ring cleanly, and every chord to sustain powerfully. 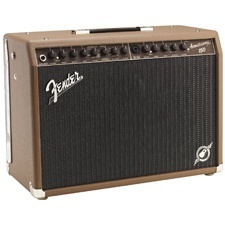 Fender has also reasonably priced this little 90 watt monster–at below the $500 mark, the Acoustasonic places itself firmly at the head of the budget pack. The Fender Acoustasonic features new voicing control which enables the user to simulate the tones of jumbo acoustic guitar, a dreadnought guitar or a parlour guitar with any acoustic guitar they want. If playing a song which requires an electric guitar sound and feel, this amp also provides Tweed, Blackface, and British amp voicing. With this amp, there is no need for a second electric guitar amp for those acoustic guitar players who also play electric. Alternatively, voicing can be turned off for pure amp output response. Other features include an XLR line out, phantom power, separate guitar and vocal channels, a large range of effects and a USB-out for any digital recording the user may need. With its super efficient 150 wattage, this class D power amp has dual 8″ low-frequency foam-surround speakers which reduces the weight of the unit significantly while still providing clean power and crisp sound. This lightweight amp is only 22.5lbs. While the Blues Deluxe might not be a strictly acoustic amp, there is a reason why many acoustic guitarists choose this amp. Capable of the dirtiest blues tones as well as twangy cleans and crisp natural notes, the Fender Blues Deluxe is a bit pricey, but it has the reputation and legacy to back itself up. Featuring 1 x 12″ special-design Eminence speaker powered by three 12AX7 preamp tubes and two 6L6 Groove Tubes output tubes, this 40 watt amp provides an enhanced midrange which fills any stage and does not hide in even the densest of mixes. It’s overdriven tones are fantastically clean and watch out for that lengendary Fender spring reverb. Other features include chicken head knobs, effects loop, tweed covering, chrome control panel and a two-button channel footswitch. 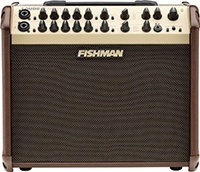 Another amp with a big reputation, the Fishman Loudbox is a player’s choice amp that has a lot of features and leaves you a lot of room for tonal selection. With a mixable 3-band EQ and built in effects, the Loudbox is extremely versatile, offering a wide array of tones and sounds. 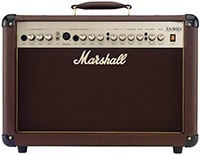 Marshall has been one of the leading amp manufacturers for decades. Until recently, they were considered a strictly ‘classic rock’ and ‘heavy metal’ amplifier manufacturer. With the AS50D, not only do they get their feet wholly wet, but they do it by offering one of the best sounding and best priced acoustic guitar amps available on the market. 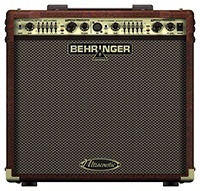 For the starving artist on a low budget, the Behringer Ultracoustic is the amp that offers the most bang for the buck not only sound-wise, but feature-wise as well. With 16 built in effects (some of which Behringer is renowned for, such as reverb), the Ultracoustic is perfect for small cafes and medium sized venues alike.